Home » »Unlabelled » 4 Techniques To Quiet An Overthinking Mind. 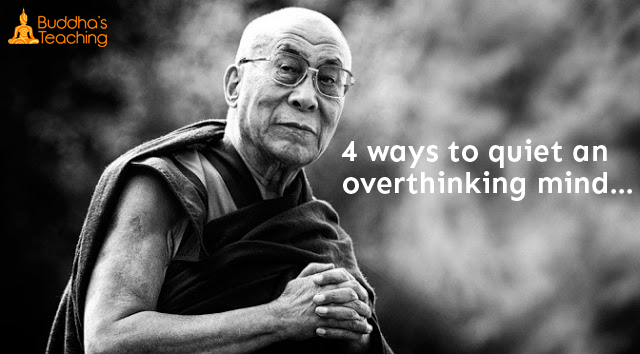 4 Techniques To Quiet An Overthinking Mind. Sometimes, my mind goes a mile a minute. It’s like I can’t stop overthinking every little thing. It’s like I’m an excited five year old from time to time. But over the years, I’ve learned to quiet my mind when I overthink things. What do I do? 1. Repeat positive, calming mantras. Sometimes I just have to tell myself to chill out, but not in a self-hating kind of way. Usually I’ll just repeat peaceful words like “calm,” “peace,” and “tranquility.” It helps me set the stage for being calm and not overthink anything the rest of the day. Each day, I spend 15 minutes in meditation. But I do it without any kind of an agenda. I don’t sit down and force myself to clear my mind. Instead, I consider everything. I let thoughts roll through, but let them move on once they’re done. Focus on deep breathing and relax. 3. Live in the present. When I overthink things, it’s because I’m thinking about the future. Instead of thinking about the future, I take time and think about the present and how good I really have it. Important goals go on post-it notes on my desk. They don’t belong jumbled up in my brain. When all else fails, I go for a camping trip. I get out in nature and let the Earth cleanse my overactive mind. Nothing like the sound of wind blowing through trees to make you chill out.